In many parts of the world, women – especially Christian women – are more religious than men. In the United States, where seven-in-ten adults are Christian, this religion gender gap is actually greater than it is a number of other developed nations, including Canada, the UK, Germany and France. More than seven-in-ten U.S. Christian women (72%) say religion is “very important” in their lives, compared with 62% of the country’s Christian men, according to Pew Research Center’s 2014 U.S. Religious Landscape Study. Roughly eight-in-ten Christian women also say they are absolutely certain God exists and that the Bible is the word of God, compared with about seven-in-ten men who say this. Christian men and women in the U.S. also differ in their private devotional habits. For example, roughly three-quarters (74%) of Christian women say they pray at least daily, compared with six-in-ten men (60%). 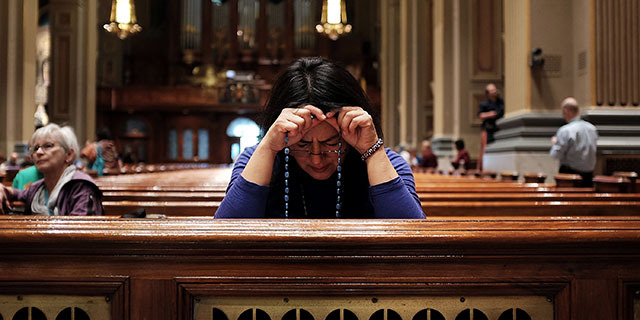 The gender gap in prayer is especially wide for Catholics and mainline Protestants: 67% of Catholic women say they pray every day while just 49% of men say the same. And 62% of mainline Protestant women say they pray daily, compared with 44% of men. Among the U.S. Christian traditions analyzed in this study, Mormons are the only group in which there is no prayer gender gap, with similar shares of women and men saying they pray daily (86% and 84%, respectively). A similar dynamic is evident when it comes to church attendance. Christian women say they attend religious services at higher rates than Christian men, but among Mormons, there is virtually no gender difference. While Christian men are, on average, less religious than Christian women in the U.S., the survey also shows that men overall are more likely to be religiously unaffiliated (that is, identifying as atheist, agnostic or “nothing in particular”). Indeed, more than a quarter of men are religious “nones,” compared with just 19% of women who are religiously unaffiliated. Even among those not affiliated with a particular religion, women tend to be more religious than men. For instance, about one-third of unaffiliated women say they are absolutely certain God exists, compared with 23% of men who say this. 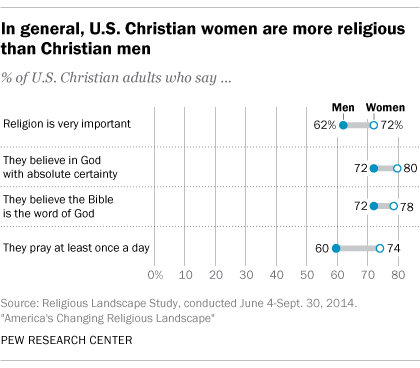 Likewise, roughly one-quarter of unaffiliated women say they pray at least daily, compared with 15% of men. Social scientists have been studying the religion gender gap for decades and have put forth a number of different theories to explain the phenomenon. Some have speculated that women are biologically more inclined to faith. Others have ascribed the religion gap to the “time lag” in the way modern secularization has affected men and women, arguing that men have historically spent more time outside the house and so were exposed earlier to social forces undermining religion. Still other scholars posit that women may be more religious because they face more “existential insecurity” – a lack of economic stability and physical safety – prompting them to seek a sense of safety and well-being in religion. This may be especially relevant in the United States, which has less of a social safety net than some other developed countries, such as Canada or Germany.